If you experience dental pain of any kind, call Mt. Pleasant dentist, Robert C. Sikes. Quick action relieves pain and saves teeth. 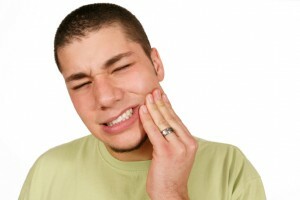 A throbbing tooth, a swollen jaw–don’t ignore dental pain. Dr. Robert C. Sikes, Mt. Pleasant emergency dentist, wants to hear from you right away so he can recommend appropriate treatment. What causes dental pain, and what you should do? Several conditions cause dental pain, and none should be ignored. Left unattended, tooth injury, a lost filling or cavity or dental abscess may produce a more elaborate and costly repair later on. Here are a few of the painful circumstances warranting immediate attention by Dr. Sikes. A broken tooth from a fall or blow to the face during sports usually causes pain, especially if the soft tissues of the face and mouth are injured, too. Rinse the tooth with warm water, and save the pieces in a clean cloth, plastic bag or small container of milk. Call Dr. Sikes for advice on what to do next. An avulsed or knocked out tooth hurts and bleeds. If possible put the tooth back in the socket, and hold it in place while driving to see Dr. Sikes. Rinse it with warm water, but do not remove any loose connective tissue. If placement is not possible, put the tooth in a clean cloth, bag or other container with milk or the patient’s saliva. The American Dental Association says that quick action and transport to your Mt. Pleasant emergency dentist will likely save the tooth. A toothache, accompanied by jaw swelling, could indicate infection from a deep cavity or even lost filling or crown. Call Dr. Sikes for treatment as soon as possible. Use a cold compress on the swollen area, and take over the counter ibuprofen to reduce the inflammation. Impacted wisdom teeth, third molars not fully erupted or coming in crooked, cause substantial discomfort, bad breath and swollen, infected gums (pericoronitis). Dr. Sikes might prescribe antibiotics for the infection and also incise the gum flap back from the tooth. Tooth sensitivity from a loose filling, hot or cold foods, exposed roots, thin enamel or cavity gets quite painful. The filling or cavity need dental attention. The other causes of sensitivity may be alleviated with toothpaste specially formulated for sensitive teeth. When in doubt as to the origin of this dental pain, call your Mt. Pleasant dentist. A laceration to the tongue, cheek, or gums bleeds profusely. Apply direct pressure with sterile gauze, and get to the local emergency room. At the first sign of dental discomfort, contact Dr. Robert C. Sikes and his staff. Their primary concern is your well-being. Additionally, to keep dental pain away for the long term, be sure to schedule your 6-month exam and cleaning. Preventive dental services, combined with brushing, flossing and a healthy diet defend your oral health and keep you smiling. Contact this experienced Mt. Pleasant emergency dentist today.